For other uses, see Necrosis (disambiguation). Not to be confused with Narcosis. Necrosis is caused by factors external to the cell or tissue, such as infection, toxins, or trauma which result in the unregulated digestion of cell components. In contrast, apoptosis is a naturally occurring programmed and targeted cause of cellular death. This initiates in the surrounding tissue an inflammatory response which attracts leukocytes and nearby phagocytes which eliminate the dead cells by phagocytosis. However, microbial damaging substances released by leukocytes would create collateral damage to surrounding tissues. This excess collateral damage inhibits the healing process. Thus, untreated necrosis results in a build-up of decomposing dead tissue and cell debris at or near the site of the cell death. A classic example is gangrene. For this reason, it is often necessary to remove necrotic tissue surgically, a procedure known as debridement. There are also very specific forms of necrosis such as gangrene (term used in clinical practices for limbs which have suffered severe hypoxia), gummatous necrosis (due to spirochaetal infections) and hemorrhagic necrosis (due to the blockage of venous drainage of an organ or tissue). Some spider bites may lead to necrosis. In the United States, only spider bites from the brown recluse spider (genus Loxosceles) reliably progress to necrosis. In other countries, spiders of the same genus, such as the Chilean recluse in South America, are also known to cause necrosis. Claims that yellow sac spiders and hobo spiders possess necrotic venom have not been substantiated. Necrosis may occur due to external or internal factors. External factors may involve mechanical trauma (physical damage to the body which causes cellular breakdown), damage to blood vessels (which may disrupt blood supply to associated tissue), and ischemia. Thermal effects (extremely high or low temperature) can result in necrosis due to the disruption of cells. There are many causes of necrosis, and as such treatment is based upon how the necrosis came about. Treatment of necrosis typically involves two distinct processes: Usually, the underlying cause of the necrosis must be treated before the dead tissue itself can be dealt with. 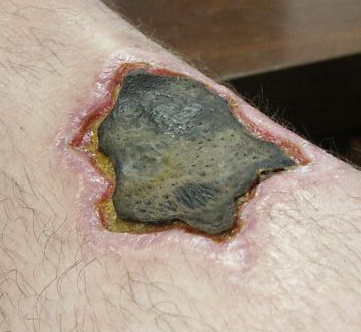 Wounds caused by physical agents, including physical trauma and chemical burns, can be treated with antibiotics and anti-inflammatory drugs to prevent bacterial infection and inflammation. Keeping the wound clean from infection also prevents necrosis. If calcium is deficient, pectin cannot be synthesized, and therefore the cell walls cannot be bonded and thus an impediment of the meristems. This will lead to necrosis of stem and root tips and leaf edges. For example, necrosis of tissue can occur in Arabidopsis thaliana due to plant pathogens. Wikimedia Commons has media related to Necrosis . 1 2 3 4 5 Proskuryakov SY, Konoplyannikov AG, Gabai VL (2003). "Necrosis: a specific form of programmed cell death?". Exp. Cell Res. 283 (1): 1–16. doi:10.1016/S0014-4827(02)00027-7. PMID 12565815. ↑ Kasper DL, Zaleznik DF (2001). "Gas gangrene, antibiotic associated colitis, and other Clostridial infections". In Stone RM. Harrison's principles of internal medicine self-assessment and board review (15th ed.). New York: McGraw-Hill, Medical Pub. Division. pp. 922–927. ISBN 978-0071386784. ↑ Rock, Kenneth (2008). "The inflammatory response to cell death". Annual Review of Pathology. 3: 99–126. doi:10.1146/annurev.pathmechdis.3.121806.151456. PMC 3094097 . PMID 18039143. 1 2 3 4 5 6 7 Craft J, Gordon C, Tiziani A, Huether SE, McCance KL, Brashers VL (2010). Understanding pathophysiology (1st ed.). Chatswood, N.S.W. : Elsevier Australia. ISBN 978-0729539517. 1 2 3 4 5 6 7 8 9 10 11 12 Kumar V, Abbas AK, Aster JC, Fausto N (2010). Robbins and Cotran pathologic basis of disease (8th ed.). Philadelphia, PA: Saunders/Elsevier. pp. 12–41. ISBN 978-1416031215. 1 2 3 McConnell TH (2007). The nature of disease: pathology for the health professions. Baltimore, Mar. : Lippincott Williams & Wilkins. ISBN 978-0781753173. ↑ Sattar (2015). Fundamentals of Pathology (2015th ed.). Chicago, IL: Pathoma LLC. p. 5. ISBN 978-0-9832246-2-4. 1 2 Stevens A, Lowe JS, Young B, Deakin PJ (2002). Wheater's basic histopathology: a colour atlas and text (4th ed.). Edinburgh: Churchill Livingstone. ISBN 978-0443070013. ↑ Saey, Tina Hesman (5 November 2012). "Cancer cells self-destruct in blind mole rats". Science News . Society for Science and the Public . Retrieved 27 November 2012. ↑ Gorbunova V, Hine C, Tian X, Ablaeva J, Gudkov AV, Nevo E, Seluanov A (2012). "Cancer resistance in the blind mole rat is mediated by concerted necrotic cell death mechanism". Proc. Natl. Acad. Sci. U.S.A. 109 (47): 19392–6. Bibcode:2012PNAS..10919392G. doi:10.1073/pnas.1217211109. PMC 3511137 . PMID 23129611. 1 2 3 4 5 6 7 Raffray M, Cohen GM; Cohen (1997). "Apoptosis and necrosis in toxicology: a continuum or distinct modes of cell death?". Pharmacol. Ther. 75 (3): 153–77. doi:10.1016/s0163-7258(97)00037-5. PMID 9504137. ↑ Nazarian RM, Van Cott EM, Zembowicz A, Duncan LM (2009). "Warfarin-induced skin necrosis". J. Am. Acad. Dermatol. 61 (2): 325–32. doi:10.1016/j.jaad.2008.12.039. PMID 19615543. ↑ Yanagawa, Youichi (10 October 1980). "Cutaneous hemorrhage or necrosis findings after Vespa mandarinia (wasp) stings may predict the occurrence of multiple organ injury: A case report and review of literature". Clinical Toxicology. 45 (7): 803–807. doi:10.1080/15563650701664871. PMID 17952752. 1 2 3 4 5 6 7 Kroemer G, Galluzzi L, Vandenabeele P, Abrams J, Alnemri ES, Baehrecke EH, Blagosklonny MV, El-Deiry WS, Golstein P, Green DR, Hengartner M, Knight RA, Kumar S, Lipton SA, Malorni W, Nuñez G, Peter ME, Tschopp J, Yuan J, Piacentini M, Zhivotovsky B, Melino G, Nomenclature Committee on Cell Death 2009 (January 2009). "Classification of cell death: recommendations of the Nomenclature Committee on Cell Death 2009" (PDF). Cell Death Differ. 16 (1): 3–11. doi:10.1038/cdd.2008.150. PMC 2744427 . PMID 18846107. ↑ Singhal A, Reis ED, Kerstein MD (2001). "Options for nonsurgical debridement of necrotic wounds". Adv Skin Wound Care. 14 (2): 96–100, quiz 102–3. doi:10.1097/00129334-200103000-00014. PMID 11899913. ↑ Horobin AJ, Shakesheff KM, Pritchard DI (2005). "Maggots and wound healing: an investigation of the effects of secretions from Lucilia sericata larvae upon the migration of human dermal fibroblasts over a fibronectin-coated surface". Wound Repair Regen. 13 (4): 422–33. doi:10.1111/j.1067-1927.2005.130410.x. PMID 16008732. ↑ Eum HA, Cha YN, Lee SM (2007). "Necrosis and apoptosis: sequence of liver damage following reperfusion after 60 min ischemia in rats". Biochem. Biophys. Res. Commun. 358 (2): 500–5. doi:10.1016/j.bbrc.2007.04.153. PMID 17490613. ↑ Cooper KL (2012). "Drug reaction, skin care, skin loss". Crit Care Nurse. 32 (4): 52–9. doi:10.4037/ccn2012340. PMID 22855079. ↑ Chotenimitkhun R, Rojnuckarin P; Rojnuckarin (2008). "Systemic antivenom and skin necrosis after green pit viper bites". Clin Toxicol. 46 (2): 122–5. doi:10.1080/15563650701266826. PMID 18259959. ↑ Edinger AL, Thompson CB; Thompson (2004). 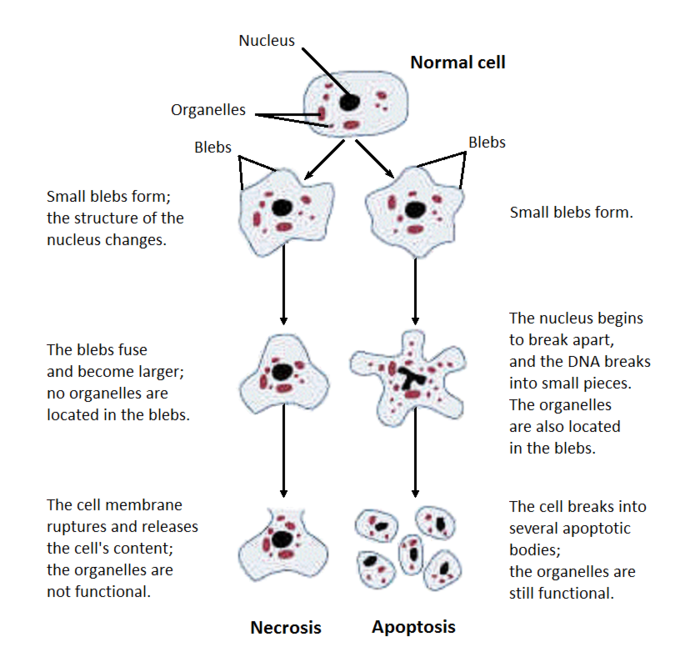 "Death by design: apoptosis, necrosis and autophagy". Curr. Opin. Cell Biol. 16 (6): 663–9. doi:10.1016/j.ceb.2004.09.011. PMID 15530778. ↑ Capon B (2010). Botany for gardeners (3rd ed.). Portland, Or. : Timber Press. ISBN 978-1-60469-095-8. Undersea and Hyperbaric Medical Society. "Necrotizing Soft Tissue Infections". Archived from the original on 5 July 2008. Retrieved 25 July 2008.